ONE Guided Sightseeing with Private Car and Driver tour (Value - $900 per Couple) in the port below. Quebec City - Please click here for the tour descriptions. St. John's, a classic harbor city, is capital of Newfoundland. Old accents and customs are common, yet Saint John is still modern. The city recently celebrated its 500th anniversary as a modern city with preserved heritage and culture. It offers old world charm, unique architectural and historic landmarks, fine cuisine and many other attractions. Historic downtown features unique sites, such as Cabot Tower on Signal Hill overlooking the harbor and the city. The famous friendliness, hospitality and charm of the people of Saint John, plus the Newfoundland folk music found in many of the lively waterfront bars, ensure a perfect visit. A 3 mile Rennies River Trail cuts through the city along a wooded stream and ends at the only public fluvarium in North America, where in late October/early November one can observe spawning brown and brook trout in their natural habitat through underwater windows. The Bowring Victorian park was donated by the wealthy Bowring family in 1911, and resembles the parks of London after which is was modeled. 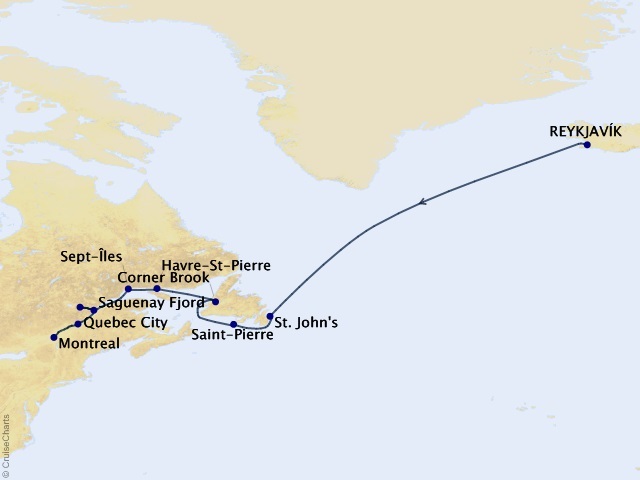 St Pierre is the southernmost island of the territory of St Pierre and Miquelon situated in the North Atlantic Ocean south of the coast of Newfoundland. It is a French protectorate consisting of two small groups of islands principally St Pierre, Miquelon, and Langlade. The islands are mostly barren and rocky but are important for cod-fishing. The City of Corner Brook - in Canada's Newfoundland and Labrador province - is nestled among the Long Range Mountains, which are a continuation of the Appalachian Mountain belt, stretching up from Georgia in the southern United States. Theatre and art are alive in Corner Brook. Corner Brook is Newfoundland and Labrador's "Host City" and is ideally positioned to host major sporting events. Experience picturesquesque Corner Brook from many groomed walking trails or visit the Captain James Cook Monument and bask in the glory of the sun setting over the Bay of Islands. Step back in time at the Corner Brook Museum and Archives or the Railway Society of Newfoundland Historic Train Site. Explore the downtown area and discover unique gifts and crafts and dine out in one of the City's many fine restaurants. Take a scenic drive along the coast of the Bay of Islands or have a more extreme adventure in Gros Morne National Park, just one hour away. The picturesque scenery of Havre-Saint-Pierre's chain of islands is an excellent get away for outdoor and nature lovers. If water is your game of choice there is sailing, rafting, kayaking, and boat tours to enjoy. Anglers will also have an excellent time pursuing world-class trout and salmon in the clear water rivers and lakes. Set-Iles is a city in the northeastern region of Quebec, Canada. The population is estimated at about 25,686 according to the Canada 2011 Census. This destination offers a diverse plant life with one of the prime destinations being the Les Jardins de l’Anse which offers 6 different gardens to explore. The Saguenay fjord allows the waters from the Atlantic Ocean and of the Gulf of Saint-Lawrence to flow into the heart of the Saguenay Kingdom. It drains the water of a catchment basin that covers 88,000 km2 and is 550 kilometres long. This arm of the sea originates at the centre of Quebec and in the northern forest east of Canada. It is unique in the world by its geographic location, the fantastic history and the distribution of the population that settled along the entire length of its shores. Montréal is truly an experience: old world charm, French joie de vivre and a modern style all its own. Montreal is a stunning city to visit and there is so much to see. Along the St. Lawrence River many people come to take a horse-drawn calèche ride through cobbled streets for romantic moments. Just miles away are the skyscrapers of the city as they tower above the city’s businesses and restaurants. Montreal is the world’s second largest French-speaking City. It's top ten attractions are: The Biosphere, Old Montreal, Biodome de Montreal, Musee d'Art Contemporain, Montreal Botanical Gardens, Chinatown, Notre-Dame Basilica, Insectarium, Cours Mont-Royal, and the Canadian Centre for Architecture.